It has been a disappointing year for butterflies so far, but there have been a few encouraging signs. Despite their low numbers, a male and female Large skipper were seen on the South Lawn on 18th June and a Common blue (see featured image) was found by Phil Reed on 19th June. There used to be a healthy colony of Common blues at the Gravel Pits, so this was particularly pleasing, after one was spotted last year. Both the Gravel Pits and Sun Lane had established colonies but both seemed to die out quite suddenly. Birdsfoot trefoil (often known as ‘eggs and bacon’) is their foodplant and their absence was made doubly disappointing since Sun Lane has had this in abundance in recent years. The Gravel Pits can’t boast the same quantities, but there are now several good patches. 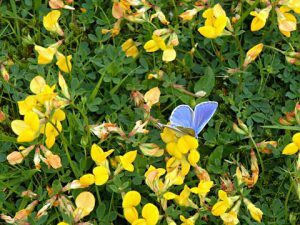 After a bit of exploring a small colony of Common blue was discovered just over the road from the Gravel Pits and, last year, one individual was spotted on the South lawn on several occasions – a small nick in its wings making it identifiable as the same butterfly. So if you visit either of the reserves any sightings will be gratefully received since the hope is they will re-establish themselves again.